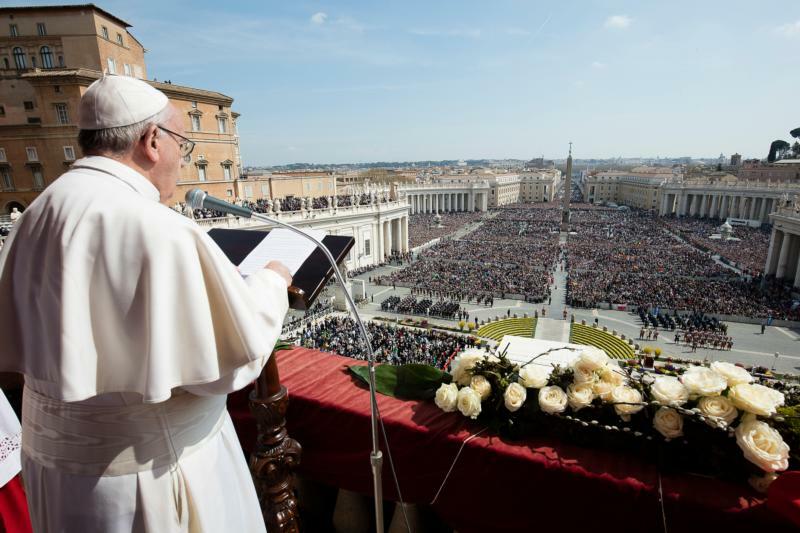 VATICAN CITY (CNS) — Easter is a feast of hope, a celebration of God’s mercy and a call to pray for and assist all who suffer, Pope Francis said before giving his solemn blessing “urbi et orbi” (to the city and the world). The risen Jesus “makes us sharers of his immortal life and enables us to see with his eyes of love and compassion those who hunger and thirst, strangers and prisoners, the marginalized and the outcast, the victims of oppression and violence,” the pope said March 27 after celebrating Easter morning Mass. Easter in Rome dawned bright and sunny; in St. Peter’s Square, the steps leading up to the basilica were turned into an abundant garden with thousands of tulips, daffodils and flowering bushes. Speaking about Christ’s power over death and sin, the pope prayed that the Lord would touch places in the globe scarred by war, terrorism, poverty and environmental destruction. He prayed that the power of the Resurrection would “overcome hardened hearts and promote a fruitful encounter of peoples and cultures,” particularly in Iraq, Yemen, Libya and the Holy Land. “May the Lord of life also accompany efforts to attain a definitive solution to the war in Ukraine, inspiring and sustaining initiatives of humanitarian aid, including the liberation of those who are detained,” he prayed. 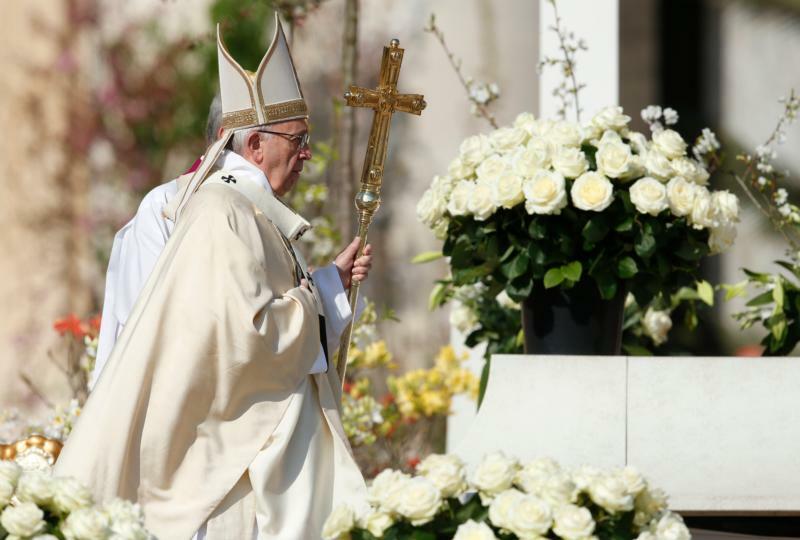 At Rome’s Colosseum Good Friday, after presiding over the Stations of the Cross, the pope offered a long meditation on how Christ continues to be scorned, tortured and crucified in suffering people around the world. “O Cross of Christ, today too we see you in the faces of children, of women and people, worn out and fearful, who flee from war and violence and who often only find death and many Pilates who wash their hands,” he said. “Christ wants to come and take us by the hand to bring us out of our anguish,” he said in his homily. “This is the first stone to be moved aside this night: the lack of hope which imprisons us within ourselves. May the Lord free us from this trap, from being Christians without hope, who live as if the Lord were not risen, as if our problems were the center of our lives. “Today is the celebration of our hope, the celebration of this truth: nothing and no one will ever be able to separate us from his love,” the pope said. During the Easter vigil, Pope Francis baptized eight women and four men, including Yong-joon Lee, the South Korean ambassador to Italy, who took the baptismal name, Stephen. The ambassador’s wife, taking the name Stella, was also baptized. The other catechumens came from Italy, Albania, Cameroon, India and China. One by one, the catechumens approached the pope who asked them if they wished to receive baptism. After responding, “Yes, I do,” they lowered their heads as the pope, using a silver shell, poured water over their foreheads. “This marked the beginning of Peter’s resurrection, the resurrection of his heart. Without giving in to sadness or darkness, he made room for hope; he allowed the light of God to enter into his heart, without smothering it,” the pope said. The Holy Spirit “does not remove evil with a magic wand. But he pours into us the vitality of life, which is not the absence of problems, but the certainty of being loved and always forgiven by Christ, who for us has conquered sin, death and fear,” he said.